Animateducated: Free Laika Event in LA area! Free Laika Event in LA area! Happy New Year everybody and if you live in the Los Angeles area, love stop motion animation and Portland weather, rsvp and drive over to the Pacific Design Center this Sunday! It was a pretty packed all day event. I arrived to see the BoxTroll's screening and the entire theater was filled up before the screening. I liked the film's story, characters and the stop motion is always amazing. The real surprise came at the end of the screening, when Jerry Beck introduced the film's directors, Anthony Stacchi and Graham Annable, CEO and Lead Animator Travis Knight, Actress Elle Fanning and Actor Sir Ben Kingsley. Kingsley was the voice of Archibald Snatcher, the BoxTroll's worst enemy. He explained that he did most of his voice work lying down in a comfortable chair and gave his performance thru his voice, allowing the animators to come up with the gestures and face expressions. Here's a very brief clip of the panel, Ben Kingsley is speaking about the characters in the film. Reference video is usually shot during the voice recording session to give the animator reference during the actor's performance. Actors will gesture or make facial expressions when recording audio and this is for the benefit of the animator to use or not use later on. Mr Kingsley only had his voice recorded and let the animators come up with his performance. 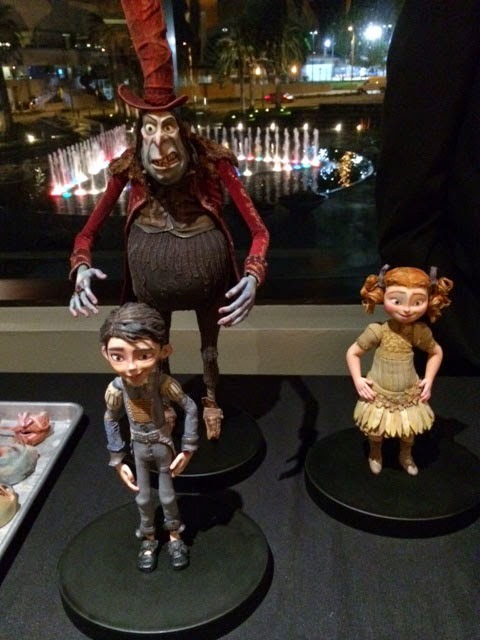 After the screening, they had a table setup displaying the actual stop motion models to show how big they really are. Here are Snatcher, Eggs and Winnie. Liaka has pioneered the facial animation by inventing a series of animated face plates which are used in lipsyncing dialogue and making facial expressions easier for the stop motion animator. 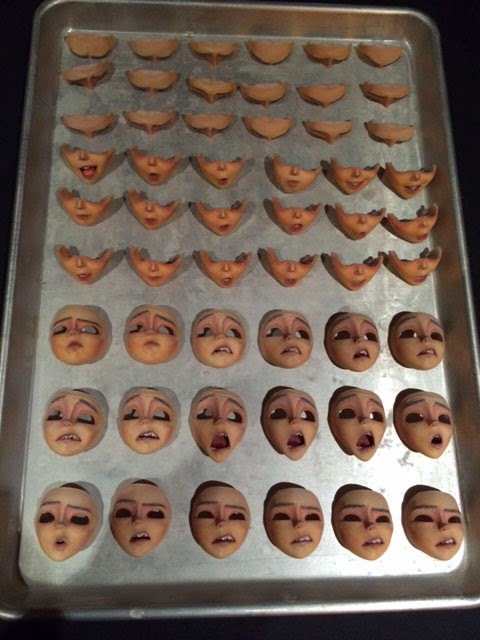 Here are some Eggs' facial expressions used in the film. The upper row are for Eggs's Brow expressions, which snap together to the lower eyes, nose and mouth row below. The full face expressions are both showing how the entire face can change expression. 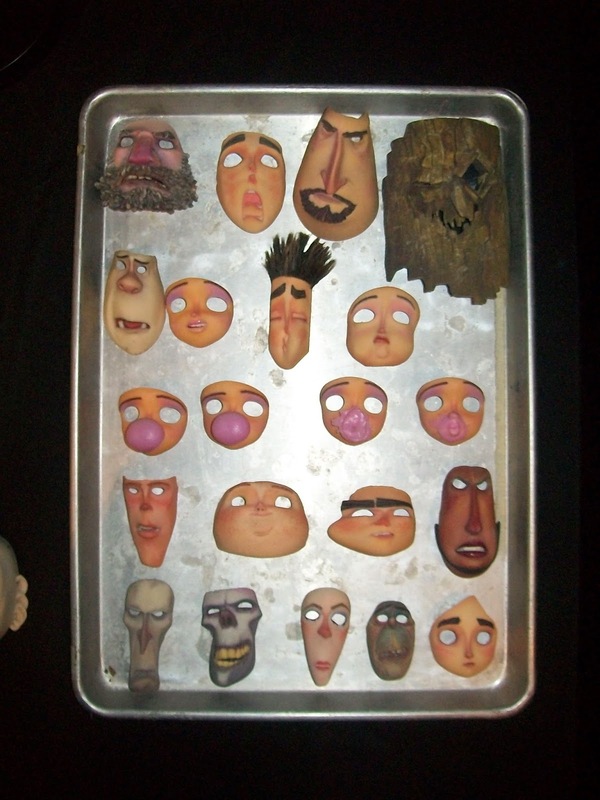 Here are a bunch of animated faces from ParaNorman. Notice the four faces in the middle are of a bubble gum popping onto the face. 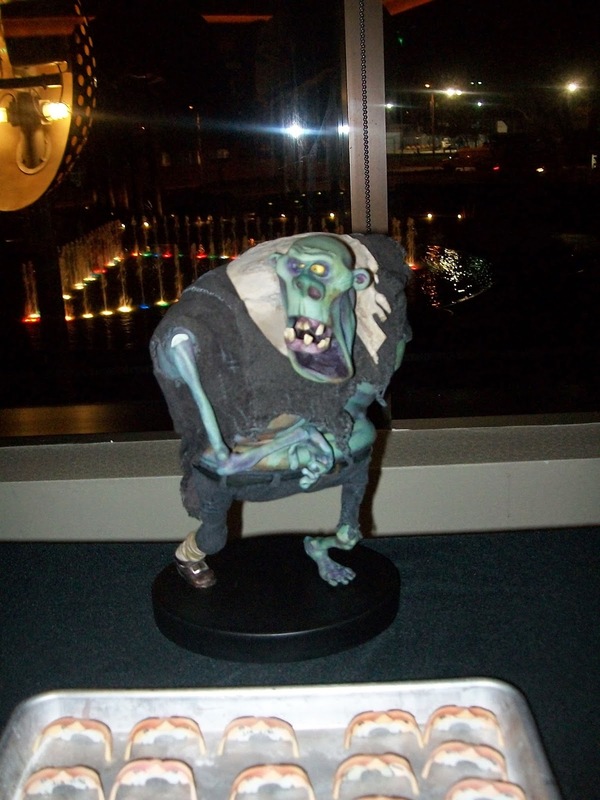 You can also see the very squished face of ParaNorman as well as the stretching of his cheek. These are replacement facial expressions which saves the animator a lot of work, so he or she can concentrate on animating the character's performance, one frame at a time. These are replacement facial expressions which saves the animator a lot of work, so he or she can concentrate on animating the character's performance, one frame at a time. Which Liaka film is your favorite?